Not much new...got some time on the car to prepare for the Calgary replacement engine. A couple hours saw the intake, exhaust/system, electrical all disconnected. Only broke one exhaust stud! I am thinking the transmission pull may be a little complicated due to its crossmember... I am not 100% sure how it is attached. Doing some reading, I am to remove the crossmember, and the nut with the mount. But once the car is up in the air, it'll be easier to have an assessment. The car was converted from an auto box to an M41, and I am not sure how well the conversion was done. 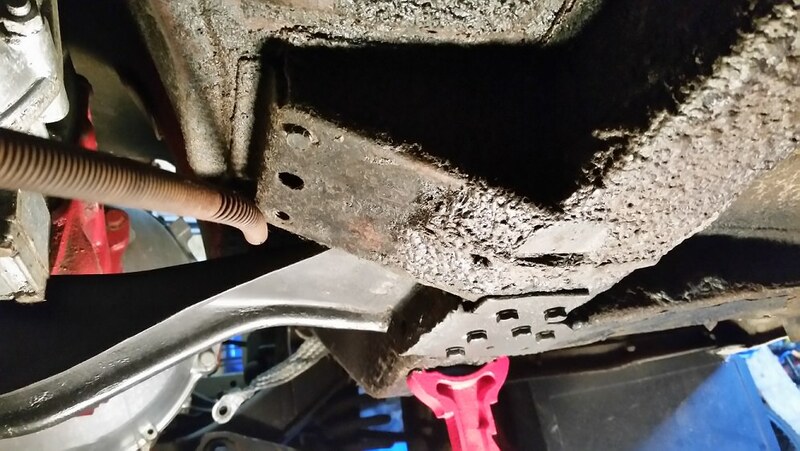 Some frame repair looks to be required, where the steering shaft passes the frame rail. Last edited by blackdog on Mon Nov 13, 2017 12:11 pm, edited 1 time in total. I'm not sure what you're asking. You remove the trans cross member - the four bolts to the frame and the nut to the mount need to be removed. Just brace the trans so that when you pull it it doesn't flop over on you (depends on engine mount condition). Then lift both engine and transmission out through the top. They originally were mounted from below and if you have a lift, this is the easy way out. Just unbolt the cross members and raise the body off the engine and trans. That's exactly the information I need. Thanks very much! You can get the engine and trans out in one piece??? I remove the trans from bellhousing and then bellhousing from engine before pulling engine, and getting the engine out by itself is tight enough. As one unit - you bet. Did mine that way (twice) and Jim's as well as the 1800. We also did my 242 that way. I never really thought about it the other way. I've got a fancy Princess Auto leveler thingy and it almost works well and I'd rather struggle with the trans on the ground. The worst is getting it over the nose cone and then down sharply. I should try your method next. Well, I have done some thinking... that could be good or bad, depending on the day. I have decided to pull the engine/suspension crossmember out of the car after I pull the old engine out. That way, I can clean everything up, powder coat and prepare the suspension and other bits, then put everything back together nice and clean-like. Brake lines and steering box will be disconnected, and any other attached bits will be removed. From what I have read, it looks like 8 bolts to remove, then I can drop the entire unit as a whole. Then it's off to Olof to get replacement ball joints, bushings, etc. and whatever else is required. I may be biting off way more than I can chew, but the timing is there, while the engine is out of the way. Readers of this thread may see more "WTF" posts than usual, concerning what to do or what I encounter. 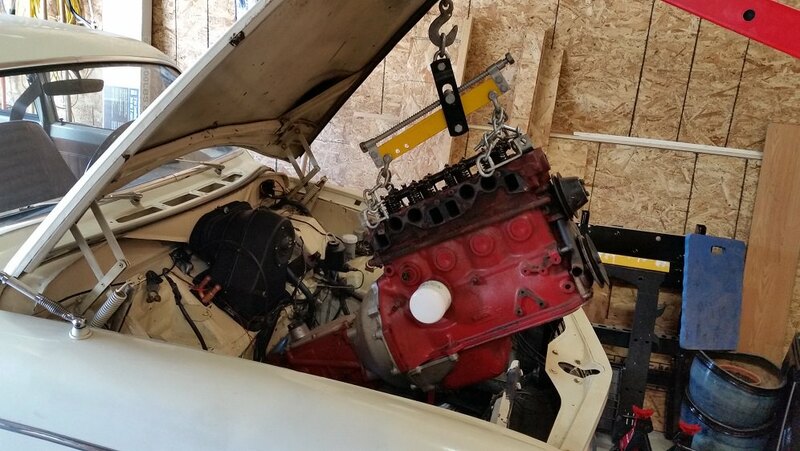 Next step: removing the existing B18 engine. Pics coming hopefully soon. I have some time over the long weekend, so I thought to get started on the engine/trans pull. 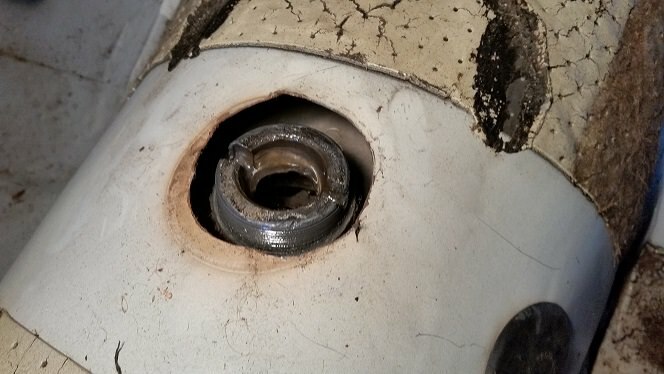 1) The bolts connecting the rear flange to the OD were not tight at all, so that was a bit worrying. 2) The transmission crossmember is causing a bit of confusion. This was previously an automatic BW35 car, which was converted to a 4 speed w/OD. The Trans crossmember is some kind of butchered-up piece of metal which appears to be bolts into the bottom of the frame rails. They unbolt fairly easily, so I imagine they are tapped into the frame rail. Left Trans mount(below). When I got underneath, a bit of "WTF" came out. Right Trans mount (looking to the forward of car, below). Not sure what to think on this. Last edited by blackdog on Mon Nov 13, 2017 12:19 pm, edited 1 time in total. Yikes - The boxes that have the threaded holes that are behind where that transmission cross member is located are your transmission cross member mounts. They do appear to be in a different position ... they should be in line with the outriggers going to the A-post like on this underside shot. That's how they are for manual transmission cars. So I'd tend to remove that girder that is under there and put in the correct cross member if you've got it. Patch up the frame rails and all will be fine. Just as a note of caution - the frame rails on these cars are 16 ga steel and are not meant to have jack stands supporting the weight of the car on them. They dent rather easily. Use the stock jacking points (they are attached to the A post and bull strong) or get those stands up under the cross member. Thanks for the note about the frame rails, Craig. I'll get those moved ASAP. 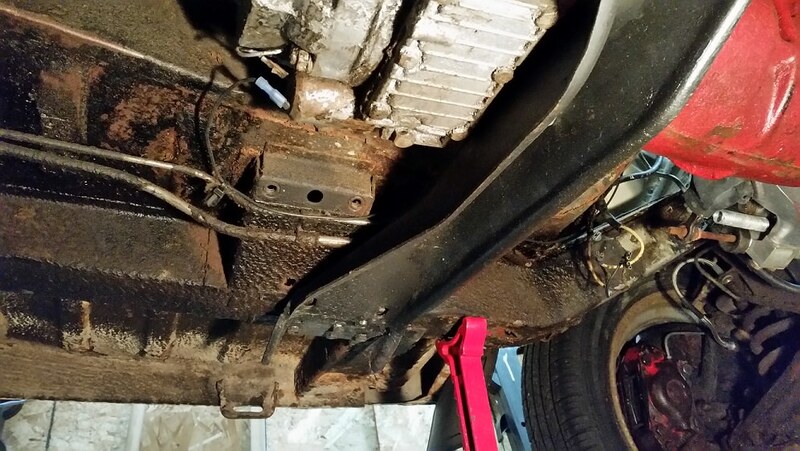 More research has uncovered a definite design difference between the location of the transmission crossmember mounts on manual and autobox cars. The automatic mounts are further back to accommodate the BW35 transmission, which was originally a part of this car. The Swem site has a writeup on an auto/manual conversion as well. I didn't think to check since everything seemed to work well at the time and didn't anticipate anything like this. I do have the proper crossmember, though... I am thinking to get some adapter plates made up to fasten to the old automatic frame mounts, and then fasten the plates to the proper crossmember. I also have one bolt in the frame mount that appears to be sheared or cut off, need to get that out somehow... good times! I'll go check my junk pile. I'm sure I've tossed them, but if I haven't you can have my old mount boxes. If not, it's not hard to make them and weld them in place then you could use the stock style trans mount and you wouldn't have to move the auto ones. I know it seems like a lot to go through, but it is probably the easiest solution. I'm also a little concerned about how many fasteners were used into the frame rail. It must be like Swiss cheese. My concern stems from a known structural weakness with these cars. The front end/engine/trans basically floats out front on those rails. These forces are counter acted by the inner fenders joining things back to the firewall and in to the A-pillar. The main area for cracks is in the base of the inner fender at the bottom (ask Matt/Jim - they both have - had this problem). Volvo fixed it up by just putting a patch over that area to double the material thickness and spot welded it in. Things to consider - spot welds are like nails holding sheet metal together. It can, and does, move. Drilling holes and using parts like this that may weaken the part and it's already at a prone area for rust and stress. So I'd tend to put it in the way it was intended and then strengthen the areas that need it (if your doing the full monty resto fix-up). One thing that I will be doing in my build is addressing that inner fender/frame load transfer with boxing to the inside and making sure the load path is as straight as I can take it to the A-pillar. Thanks, Craig, I am in agreement with you to do the job right. Unfortunately I don't have the equipment or the skills to undertake such a job. I'll put some local feelers out for some recommendations for the labor and fabrication. I was debating the pros and cons back and forth between the way things were (the extremely least attractive swiss-cheese mount), to adapter plates off the 'auto mounts (might be ok), to actual proper mount boxes (the best choice overall). It only makes sense to do it right once. As for the holes on the frame rails, my thoughts are that a welded plate overtop of the majority of the framerail on each side would work well. I am a little hesitant to cut out sections of the frame rail, I don't want to compromise more of the rigidity it has left. I also have noticed that the air duct over the tunnel is different between the 'auto and manual cars. The manual car would have a hole in it for the shifter, and the duct for the 'auto does not. That's the reason why the duct doesn't fit that great around the hole in the tunnel. Also, now that I think about it, the tunnel is wider as well to accommodate the BW35. I always thought my pedals were crowded. Now that suspicion is confirmed too. There are a couple posts on swedespeed about offset pedals that turned out to be quite nice. Good news today, the engine and trans are finally out. 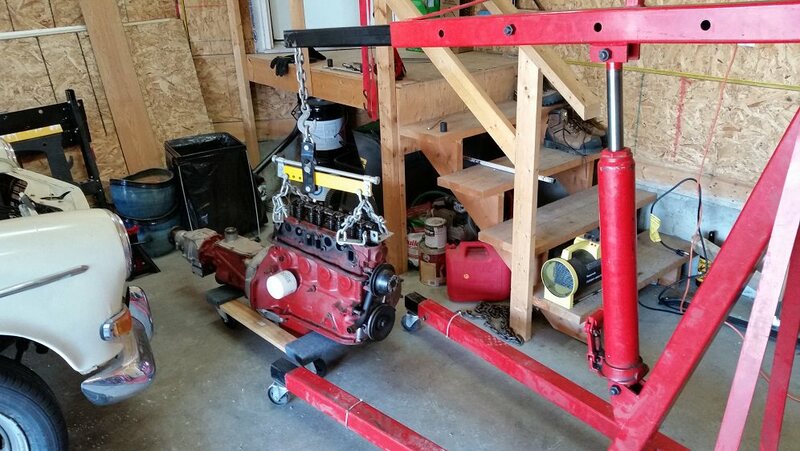 In the end, I bolted up the trans back to the block and lifted it out in one piece. I was sick of mucking around under the car trying to get it loose. The removal was a bit tight, but it all came out albeit with a few scratches. I look at the gaping hole, and I now I want to repaint the entire engine bay. The jobs are starting to stack up as they come along! Next step is to separate the trans and the block on the floor to get to the flywheel and clutch. I believe a hand grenade will do the trick at this stage. It was a good feeling to get this done. Car looks like a gasser now with the front end in the air! Pics are below. Last edited by blackdog on Mon Nov 13, 2017 12:21 pm, edited 1 time in total. I looked and I've tossed them. Any reasonable tin basher shop could fab up a set in a jiffy and get you going. A patch over that rail would do wonders. Take the hood off next time! It's easier than trying to avoid bashing the hood. Do you need a manual trans tunnel vent thing? I've got one around somewhere. I don't need it. Pedals are spaced far enough apart in these things that I've had no trouble driving in my Sorel's. That said, one of the best mods I ever did was to just bend the gas pedal so it wasn't all the way on the floor. You can also bend it sideways to get it off the tunnel. Couldn't be easier and made driving much nicer (a heal-toe downshift was then possible). For sure, I'll take that tunnel vent, I'll send you a PM with contact details. It's likely it's missing on the car in any case. Thanks!